Until recently startup companies used a variety of ways to fund their businesses. Some of the ways include: borrowing from friends or family, borrowing from a bank/private lender, personal savings and others. However, over the past few years crowdfunding has been attracting the attention of many startups and the number is annually increasing. Crowdfunding is a way of raising finance by asking a large number of people to offer a small amount. 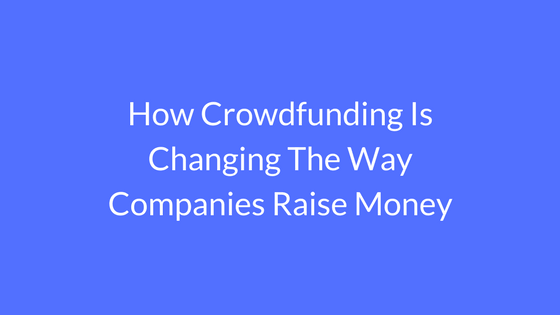 You can use crowdfunding to raise money for a number of different ways such as charity, financing a business idea, looking for investors and so on. There are hundreds of crowdfunding platforms and each one is unique, you will need to do your research and find the most suitable platform for your project. There are also different types of crowdfunding. Below are short descriptions of a few different types of crowdfunding. A donation as the name suggests is where someone asks for donations from donors through a crowdfunding platform. Donation crowdfunding is mainly used by people who want to raise money for a non-profit cause such as: raising money for a charity. There are numerous crowdfunding that deals with donations, some of the big names include GoFundMe and Crowdrise. Reward crowdfunding is where backers pledge an amount of money in exchange for either a reward. The reward can either be a product or service. The two most popular crowdfunding platforms for reward-based crowdfunding are Kickstarter and Indiegogo. For example, a startup that wants to launch a smartwatch would go on the Kickstarter platform and create a page giving a description about the smartwatch. Backers will then pledge money to receive the smartwatch after it is produced by the startup company. Choosing which platform to launch your project on should be based on the core objectives. If your core objective is about building a community without having to give away equity in the business, then websites that a reward-based is the best option. Launching on Kickstarter and Indiegogo helps you understand how well people actually like your project. You have nothing to lose and you won’t be giving away shares in your business. Kickstarter is probably the most well known and popular reward-based crowdfunding platform in the world. It also boasts the highest success rate of all reward-based crowdfunding websites. It has managed to collect pledges of more than $3 billion since its launch in 2009. How Crowdfunding is changing the way companies raise money. Raising capital has always been one of the most difficult challenges that face startup companies. Most startups struggle to secure loans or raise money in other ways to finance their business. The power of the internet has broken down a lot of barriers and made it easier for people to interact and share ideas. Facebook, Instagram, Twitter and others have all had massive impacts on a global scale. One of the latest trends that have been catching attention is crowdfunding. Crowdfunding is begging to have a massive impact on how startups and creators raise money. This has sparked confidence among project creators and more projects are being launched than ever before. Crowdfunding is simple yet very effective and can help save companies costs. It is also a way for startups to find out how customers will react to their projects and whether it will have a future or no. Crowdfunding has made it possible for startups to reach global audiences through platforms like Kickstarter and Indiegogo. Those who are in need of capital can turn to people in different parts of the world, something that was nearly impossible not long ago. Since it’s launch in 2009, Kickstarter has managed to successfully bring over 130,000 projects to life and raise over $3.4 billion. One of the biggest success stories on Kickstarter has been the VR headset Oculus Rift. The project was successful that is managed to raise over $2 million. However, the success of this product didn’t stop there, two years after launching on Kickstarter, the company was bought by Facebook for $2 billion. This example demonstrates the power of crowdfunding and its endless possibilities. The good thing about crowdfunding is that you have nothing to lose, you don’t need to spend a lot of money to launch your project on Crowdfunding platforms and you get the chance to see how the audience reacts to your project. Another example of successful products is the Pebble Smartwatch which managed to raise over $10 million. After such success, the company turned to crowdfunding twice for their second generation watch which raised over $20 million and another $13 million for their fitness-focused smartwatch. Crowdfunding has become so popular that big companies are now starting to use crowdfunding platforms for marketing purposes. For example, Microsoft, Coke, Dodge, Honda and others have all turned to crowdfunding one way or another. Crowdfunding has changed the way companies raise money. Instead of turning to banks or loan providers, companies are now turning to the masses to raise the money they need. There are many more benefits of crowdfunding and it has definitely changed the way people launch their startups.